Summary: A hike and technical climb to the summit of 7730 ft Baboquivari Peak via the Forbes Route approaching from the east side of the mountain. 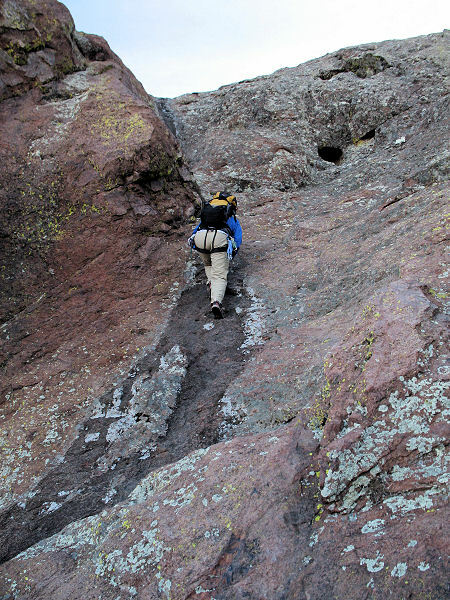 The Forbes route is considered the easiest climb to the summit (rated 5.6). The trip is best done in the spring or fall in dry conditions when no ice or snow is present. 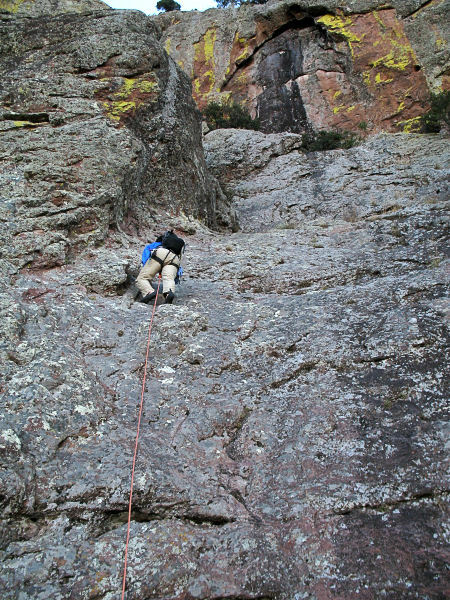 Though the climb is easy, the trip is suitable for technical rock climbers only. A fall on this route could be (and has been) fatal. 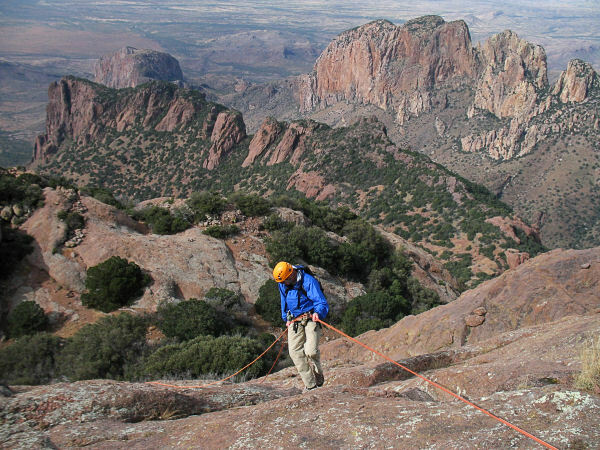 To complete this hike you'll need: a 50m rope, shoes with good traction, a harness, helmet and 6 long slings with carabiners to tie off the ladder hardware and clip a few bolts. 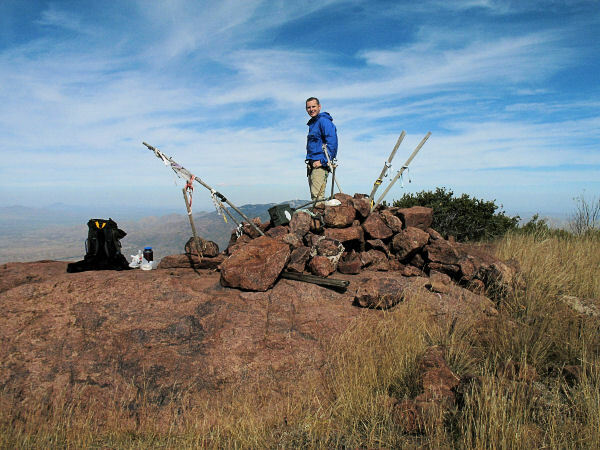 Bring a jacket in cooler weather in case it's windy on the summit. Directions: From Tucson, head south on I-19 to Exit 99 for Ajo Way (which is also Highway 86). Head west on Highway 86 to Highway 286 and turn south (left). Follow Highway 286 for almost 30 miles to milepost 16. Take your first right after milepost 16 onto a dirt road at a set of mailboxes. Follow the dirt road for 2.6 miles to a fork in the road (and sign for Morman Corral). Turn right at the sign and continue along this somewhat rougher dirt road staying on the main track at any junctions. When in doubt, just follow the road that heads towards the mountain. Soon you will come to a white, steel gate. Park at one of the small pull offs in front of the gate. This area is on private property, so please be considerate. Hike Description: From parking area, walk through the gate and follow the dirt road and signs for the 'trail'. The road winds past a ranch house and corral to the start of the path which leads up Thomas Canyon. Tall grasses obscure the trail in a few sections, but overall it is not terribly difficult to follow. Look for cairns to mark the way at any confusing spots. The path climbs at a moderate grade, becoming very steep as it eventually climbs up to a wooded saddle with a few small camp sites. 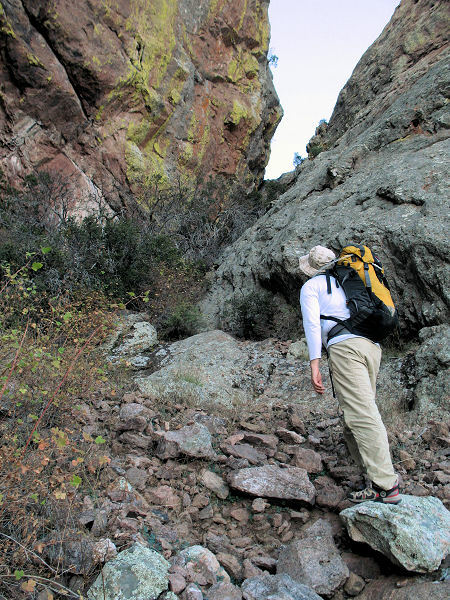 Look for a use trail which heads west (left) from the saddle and begins climbing steeply up the ridge to the rock face above. When you have a clear view of the rock, traverse to the right a short distance and aim for a prominent notch in the rock above. Climb up into the notch to the first of three climbs. This first is about 30 feet climbing under a boulder wedged in a crack to the right. There are 2 bolts and hangers at the top of the climb that may be used as an anchor on the way back down. Once up, follow the base of the rock around to the right until you come to a sloping ramp and climb #2. There are good hand and footholds up the short climb. Once up to a point where you can walk, be sure to identify the bolts and hangers a short distance to the right of the easiest route up. Continue your traverse around to the right, remaining below a 6 foot steel pole that is sticking out of a large rock above (look for a faint trail where the route heads through the brush). Soon you'll arrive at the base of the "Ladder Pitch" which features some old steel hardware imbedded in the rock from an old ladder that used to be in place here. There are several bolts and pitons of varying degrees of quality (for the most part, lesser quality) that can be used for protection for the 70 foot slope. Climb up and to the right towards a small tree sticking out of the rock. 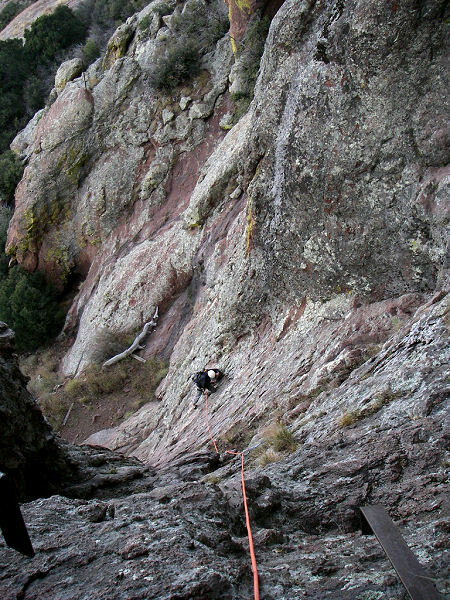 There are two solid bolts connected by a chain next to the tree that can be used for a belay coming up and a rappel anchor on the way down. Once up, you can take off your harness and stash your rope (they are no longer needed), then scramble up through a small notch to the right and follow the rough path and cairns that lead the rest of the way to the summit. 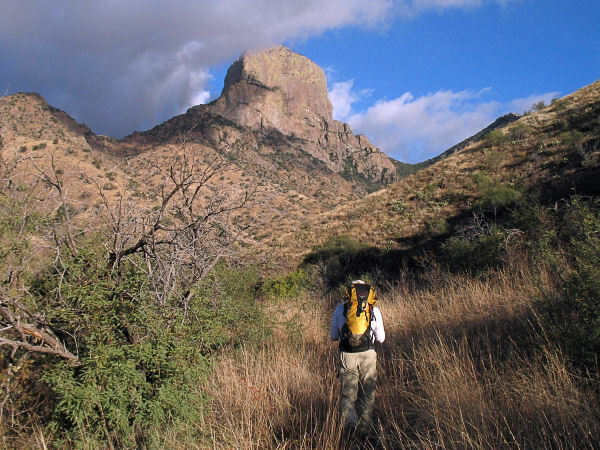 Baboquivari Peak plays a prominent role in the Tohono O’odham creation myth involving the god I'itoi. There is a tradition of leaving I'itoi a gift on the summit, which explains the trinkets you'll find up there. Take in the great 360 views, sign the register, and when ready, return the way you came rappelling those sections you climbed on the way up. 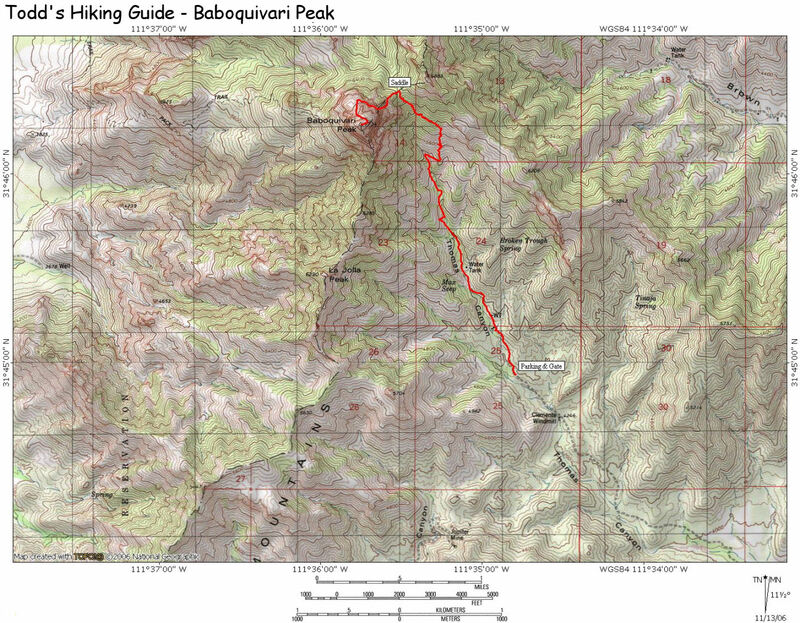 The author and a friend completed this hike at a brisk pace in 7.5 hours. Be aware that larger groups will take longer, likely much longer - plan accordingly. The mountain seems to be well known for trapping people on the summit after dark. Baboquivari Mountain. Rapping pitch #2 on the descent. #1: The notch. #2: The sloping ramp.